Stage 1A sold out quickly! 16 new lots in stage 1B now released from 2082sqm to 3519sqm. 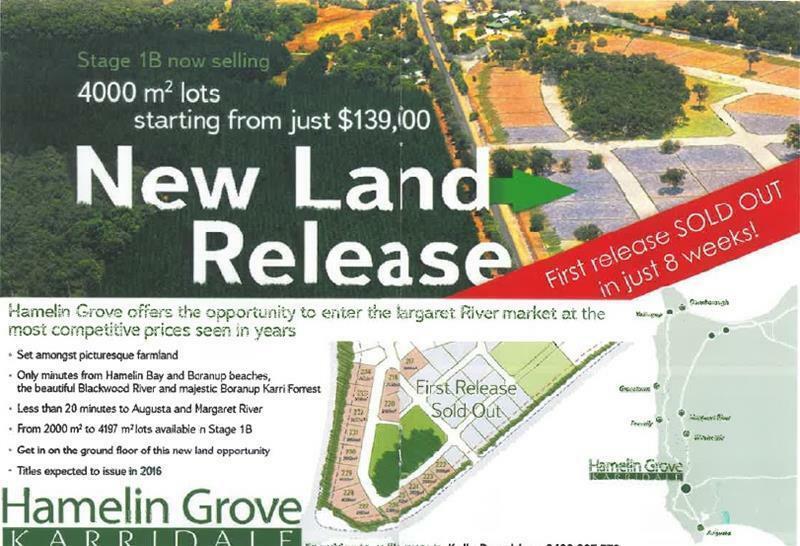 Hamelin Grove offers you the opportunity to enter the property market at the most competitive prices seen in years. This is a boutique rural development set away from the hustle and bustle. Your lot is designed to be large enough to afford privacy and give your family room to grow and place. Hamelin Grove is close to good schools and only minutes from the ocean, river, forest and all the delights of the Margaret River Wine Region. It is a stunning country environment for your next home, and invest in your future. All lots are to be serviced with underground power and phone. Plus all lots will also be boundary fenced prior to settlement. With prices starting from $139,000 come in and secure your future today!